In this interactive SmartNotebook lesson, students are able to review their understanding of the distributive property with polynomials. They then apply this knowledge to new special products [eg. 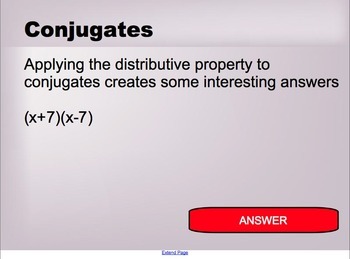 (2x+3)^2] and conjugates [eg. (x+3)(x-3)]. 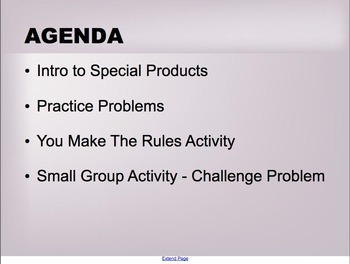 With this new knowledge the students can then develop a set of "rules" to follow in order to help them complete a group challenge problem. 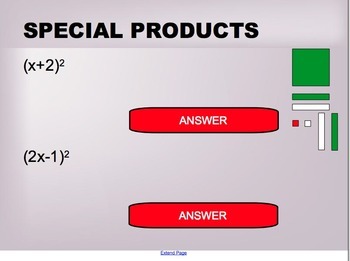 For additional help in setting up this lesson, look for the "Special Products and Conjugates Lesson Plan" in my product library!